My laboratory investigates regulatory steps in phototransduction and how defective signaling leads to death of rods and cones. 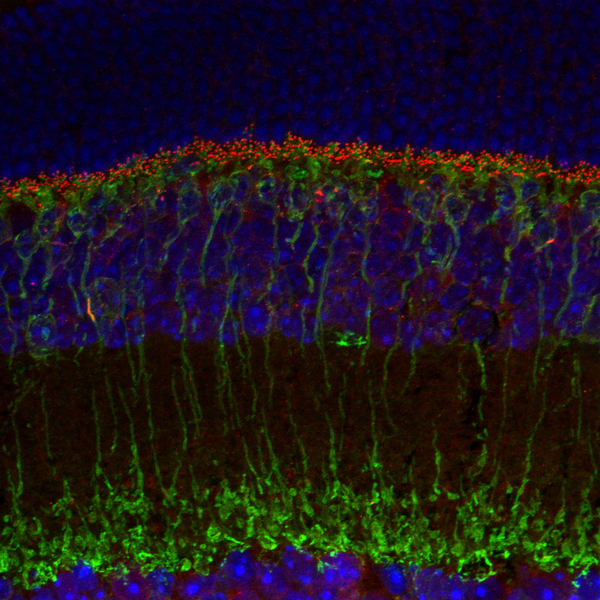 We are also interested in how the input (or the lack thereof) from rod and cone photoreceptors affects retinal circuitry during development and disease. Our approach is to create transgenic mouse models using gene addition, targeted gene knockout or gene knock-in for introducing subtle mutations. These lines of mice then serve as platforms for multidisciplinary studies. Our area of expertise is in molecular biology, biochemistry and various imaging modalities that include light microscopy, electron microscopy and fluorescence microscopy. We collaborate with electrophysiologists who use single cell recordings and multi-electrode arrays to record from a large population of retinal neurons to study cell and retinal circuitry function.